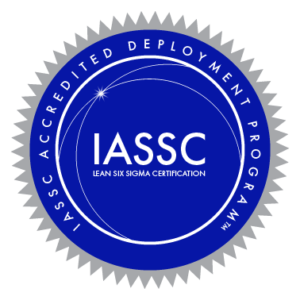 An Accredited Deployment Program (ADP) recognizes an organization or division that conducts an internal Lean Six Sigma training program, initiative or deployment and receives IASSC Accreditation. ♦ Shows that your organization values and provides a Best-Practice Certification Architecture and Protocol when using IASSC Exams. ♦ Allows your organization to directly deliver IASSC Exams to your candidates under the Exam Administration Program protocol. ♦ Benefit from Special Pricing, including Proctor Credit, volume and pre-purchase discounts for delivering IASSC Certification Exams to your candidates. ♦ Accredited Deployment Programs are listed on our website along with an IASSC Accreditation Report that provides shareholders, management and employees with an independent source of program verification. ♦ Your certificate of accreditation, displayed at your place of business and on your intranet or website, gives a favorable impression. ♦ Industry leaders, businesses and consumers have praised IASSC’s Position, Accreditation’s and Certification programs. Your Accreditation makes you a part of this LSS industry-wide initiative. ♦ Standards and Certification Best-Practices promoted by IASSC, and adhered to by your Accredited Deployment Program, foster confidence and benefit the Lean Six Sigma Industry and your program. IASSC seeks to characterize various aspects of your program through the application and follow-up collaboration process. ADP’s are distinguished from other internal Lean Six Sigma Programs in that this designation speaks to the quality of the program governance and training that the organization has established as a continuous improvement Program. Therefore it is the responsibility of the IASSC accreditation team to make a reasonable and fair evaluation of aspects based on these criteria. The core objective is to verify that ADP’s conduct Lean Six Sigma training in a robust and consistent manner, their instructors are competent to instruct the methodology and the course content is consistent with the industry’s generally accepted Bodies of Knowledge as characterized by IASSC. In addition IASSC will seek to verify that the organization conducts business in a manner consistent with the principles of the IASSC Code of Conduct. Please review, complete and submit the ADP application. An IASSC representative will be in contact with you and request the following supplemental information. For the purpose of understanding the governance of your program we will request that you submit a Continuous improvement Organizational Chart showing the relationship between the operating units and the Lean Six Sigma program. For the purpose of Materials Evaluation applicants will be requested to submit Tables of Content and any other descriptor they feel with help assess the correlation between the applicant’s course content and the IASSC BOK for each belt level. The level of correlation does not need to be 100%, however it must be sufficiently inclusive of the IASSC BOK such that a course participant would possess the knowledge of the topics to a large enough degree that they would be expected to be successful when sitting for the IASSC Certification Exam. Applicants must describe their training program Delivery Schema; that is, how their belt courses are taught. As of March 2016, IASSC expects to see training program durations of ~140 hours for Black Belt, ~56 hours for Green Belt, ~21 hours for Yellow Belt and uses these standards as guidelines in the assessment of a providers courses. Variations in training methods (in-class, e-learning, video series, blended, etc. ), class formats (University, Corporate), class sizes, prerequisites, supplemental training / learning activities and on the job training can cause this guideline to be challenging to assess. Nevertheless, every provider seeking accreditation should be prepared to define how their programs compare to these guidelines and reasonably justify deviations. IASSC uses training duration as one measure to assess the quality of a providers training programs. This measure is considered in part and parcel with other measures such as IASSC Certification Exam performance history, if applicable, student and customer reviews who have engaged in the providers training programs, when appropriate, along with the other criteria required to achieve this accreditation. Therefore, in certain circumstances, providers may successfully gain accreditation with training durations that are somewhat less than these guidelines. Nevertheless, this guideline provides a valuable yardstick to assess a providers training programs. For the purpose of Instructor Evaluation the ADP applicant should request that each trainer, employee or contractor, who the ADP uses to conduct Lean Six Sigma training complete the Accredited Training Associate (ATA) application. The ATO fee shown below includes the right to accredit up to twenty (20) instructors with the exception that each ATA applicant must pay an Exam Fee of $195 (Retail Price – $395) to sit for the IASSC Black Belt exam.